So… I’ve plugged my chilli plant into the internet. Every minute it will report how moist its soil is to a server on the web. Below is a live chart of that data - check it out - you can see exactly how moist my chilli plant is right this second. Wow, this is the sort of stuff the Internet was built for… probably. The x-axis is time - one pixel per 5 minutes. The y-axis is moisture level in an arbitrary unit - the number is actually a reading of one of the arduino’s analogue pins which has 10 bits of resolution, so it has the theoretical range of 0 - 1023. Saying that if the chart ever reads 0, then my chilli has either been long dead, or I have hi-jacked the arduino for my next project. A normal reading should be somewhere in the range of 400 - 800. Update 2012-11-05: The Arduino Plant Watering system has been turned off for now, so there are no live charts anymore. The system did it's job, I got some tasty chillis and now I need the arduino for the next project. Instead of the live charts, here's a couple of images to give you an idea of what the live charts looked like. Originally they were lovely interactive HTML5 canvas charts with axes - trust me ;) Check out this git repo for the code behind the live charts. This data is really useful. I have a tendency to over-water plants and this chart would tell me when the soil was dry enough to warrant a watering. Sometimes the soil would look really dry on the surface, but the chart would indicate a lot of moisture beneath the surface. But seeing as the the arduino now already knows how moist the soil is, the next step was to get the plant to water itself and take my over-watering habits out of the equation all together. So that’s what I did. Once the moisture hits a certain threshold, the arduino waters the chilli. At the moment I am using a threshold of `525` `425` 450 which is the red line on the above chart. The below chart indicates events when the chilli has decided to water itself. So what’s the hardware and software behind the charts look like? The diagram below shows the circuit. I tried the three different resistors I had to hand and the highest one (10kΩ) seems to work the best. Arduinos support power adapters between 9v and 12v, so get a solenoid valve that operates in this range. Check the operating pressure of the valve. The one I bought had a range of 0.02 ~ 0.8Mpa which seemed to work fine for this gravity fed system. I had the idea of using a hiking hydration system I already had to feed the water, but bought a couple of hose tails and a longer piece of hose to hook everything up. Below is the circuit diagram for driving the solenoid valve. My electronics knowledge is poor, however I managed to cobble this together from various research and it seems to work. 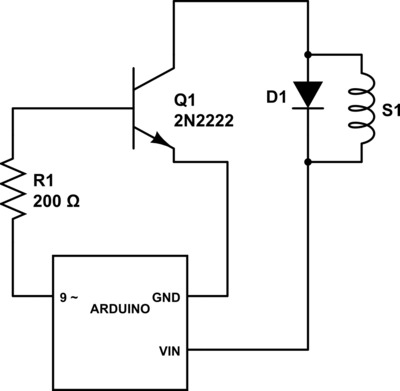 The arduino’s VIN pin gives you access to the the input voltage when using a mains adapter to power the arduino. I used a 12V 1500mA adapter I had in the flat. The diode in parallel with the solenoid is there as a snubber diode. This project required very little server-side programming. I used cube to store the time-series moisture and watering event data, which uses node.js and mongodb under the hood. As mentioned in their docs, Cube is designed for internal use only so I added a simple proxy using node-http-proxy to lock down write access to the cube server - after all, I don’t want anyone hacking my chilli plant! Cube exposes a RESTful API which my arduino could happily talk thanks to the aJson library. All I had to do was deploy this lot onto a Amazon EC2 instance and the server-side work was done. Update 2012-01-13: I have written a part 2 blog post which goes into much further detail around how to set up the software for this project. Check it out! Amazon EC2 is pretty awesome. In under a minute you can fire up a server in the cloud and SSH in. The SSH access combined with the fact you can run your choice of OS, makes it much more flexible than other cloud platforms as a service, such as Heroku, Google App Engine and Cloud Foundry. The down side is that there is a lot more configuration to do, so it is probably going to take a little longer to deploy your app, than it would with Heroku. Scala is a really nice programming language to work with and is easy for devs coming from the Java world (like me) to pick up, due to the fact it runs on the JVM. I thought I’d share the six main reasons I’ve been using Scala for many of my projects at the moment. I was lucky enough to get given a Chromebook whilst attending Google IO 2011 last year and I must admit - I really like it. At first I thought I would get annoyed at the inability to install local programs (other than Chrome and the shell it comes with) - in reality however, when at home, virtually all my computer usage is on the Chromebook. I guess a browser and shell is all I need. When I decided to start writing this blog, I played around with blogger, wordpress and tumblr, but didn’t really get along with any of them - they all seemed a bit too heavyweight for what I wanted. I didn’t need much - just the ability to specify some HTML/CSS for the styling and then a quick and easy way to write and publish posts. In my previous post I talked about my motivation for creating pelicangit. I’ve spent this last week polishing it up a bit and have now made v0.1 available on PyPI. If you already have pelican and pip installed on your machine, installing pelicangit is now as easy as running sudo pip install pelicangit. We needed to be able to document the URIs, HTTP methods, querystring parameters. We wanted to be able to specify a bit of descriptive text associated with each API call. A tool embedded in the docs that allowed the reader to call the live deployed API would be a plus. Being able to define the schema of JSON objects returned by the APIs was a must have. I was out on a walk on a cold day and thought it would be great to be able to remotely turn on the heating in time for when I got back home, which led to this; my first Arduino project. The remote control is achieved over the Internet and the form is web based, so could equally be controlled via any mobile phone with a web browser. I’ve mentioned in my previous posts how much I like my chromebook and last week Google released version 19 of Chrome OS, with some pretty major updates. I’ll be honest; I’m not a fan of the changes. A few months ago I wrote a blog post about gotchas when deploying applications to Amazon EC2. Despite not developing anything for EC2 at the moment, I learnt a new one today. It all started when I received a bunch of emails from Cloudkick (the monitoring system I mentioned in my previous post) stating that the API I had deployed there about a year ago was timing out. So I SSHed in to see what the deal was. Proudly powered by jekyll, which takes great advantages of ruby. Tweaked theme from SmashingMagazine, thanks!